Claims and counter claims about the draft IPPC report are detailed in the latest Ben Cubby warmist opus in the Sydney Morning Herald. Apparently there was a section in the latest draft allocating a large part of warming to solar influences but according to Cubby and Church of the CSIRO that part has now been deleted after a review of peer-reviewed research. Who do they think they are kidding? Are they saying that the solar influence was just whacked into the draft report without any review? That the whole draft report is just some huge document full of un-reviewed science that needs editing? Where I come from a draft is a final document ready for final editing and it seems in this case that the editing that was done on ideological and political grounds removing the solar reference. EVIDENCE for climate change has grown stronger and it is now ''virtually certain'' that human greenhouse gas emissions trap energy that warms the planet, according to a leaked draft of the next major Intergovernmental Panel on Climate Change report. Prepared on behalf of the United Nations every five or six years to summarise climate change research, the panel report draws on hundreds of peer-reviewed papers. The draft expresses even more confidence than the 2007 report that changes being observed across the planet are historically ''significant, unusual or unprecedented''. It says that carbon dioxide is the biggest cause of climate change, far outweighing natural causes. The concentration of atmospheric carbon dioxide is the highest in 800,000 years. The draft document - due to be released next year - was leaked by climate sceptic Alec Rawls, who runs a website called ''Stop Green Suicide'' and volunteered as a report reviewer. Mr Rawls claimed the report contained an ''admission'' that galactic cosmic rays were having a strong influence on the Earth's climate. But a lead author of the relevant section of the report, Professor Steve Sherwood of the University of NSW, said the theory had been rejected later in the report after a review of peer-reviewed research. Dr Church said the weight of evidence linking human activity and climate change had strengthened since the previous report. The draft builds on the findings of the previous IPCC report that warming of the climate system is ''unequivocal''. Successive opinion polls this week have indicated the Gillard government would be wiped out as we enter 2013 which is an election year, Newspoll and Essential Research both have Labor trailing the Coalition by 8 points 56 to 44 two party preferred. This reverses earlier Labor gains and puts Gillard's leadership under pressure.It is probably in the oppositions interest to keep a damaged Gillard in the PM's seat as she is probably unelectable. VOTER support for Labor and Julia Gillard has fallen after the final week of parliament, ending the government's recent momentum and allowing Tony Abbott to edge closer as the nation's preferred prime minister. After recovering and holding voter support in recent weeks, Labor's primary vote has slipped back to its level at the start of the year, and the Prime Minister's lead over the Opposition Leader is now the narrowest since September. According to the last Newspoll survey for the year, conducted exclusively for The Australian at the weekend, Labor's primary vote fell four percentage points to a six-month low of 32 per cent. The Coalition's primary vote rose three points to 46 per cent - its highest level since the end of August. The intensely personal nature of the politics of the last week of parliament appeared to damage both leaders. The Coalition used the final sitting week to accuse Ms Gillard of breaching the law in relation to the advice she gave on the incorporation of an association she later described as a union "slush fund", while the government accused Mr Abbott of being negative, running out of puff and being "gutless". Meanwhile Larry Pickering has his say on Labor's handbag mafia and the feminist attacks on Tony Abbott. The UK is doing it tough borrowing 2 billion pounds every week to survive and taxpayers will be happy to know that the borrowed money is being spent wisely. Millions of the borrowed money are being spent to reduce cow flatulence in Colombia instead of wasting it on UK schools, hospitals and roads. Pensioners will get a warm feeling to know of the government largess going to to Turkey to build windmills which the Turks are not silly enough to fund themselves. Millions of pounds of British taxpayers’ money has been spent on a scheme aimed at reducing the flatulence of Colombian cattle, The Mail on Sunday can reveal. 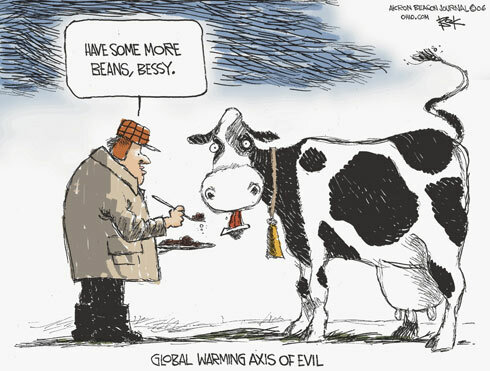 A £15million grant to ranchers and other organisations in the South American country was part of a £2.9billion package of ‘climate aid’ to developing countries which critics called ‘ludicrous’. The initiative aimed to improve animal diets by cultivating trees and plants on their grazing lands – in doing so reducing the amount of methane escaping through belching and flatulence. It is symbolic that this green gabfest is being held in California the poster-child of green policies in action , policies that are sending the state bankrupt , one city at a time. Perhaps the 20,000 visitors will compensate for a short time for the exodus of businesses heading for friendlier states. I wonder if one of the topics for discussion will be the amount of jet fuel emissions caused by transporting 20,000 passengers to California. Following being called an "idiot denier" which is obviously OK with the moderator's so-called community standards I attempted to reply to defend myself.
. Idiotic deniers? Reduced to name calling again.I am happy to have some august company in the APS who you can also call idiots if you like. It is good to see Hansen at the gathering wanting to jail those who disagree with him . Is the rumor true he wants the next rally to be at Nuremberg where they have a great historical site and delegates could wear armbands to identify themselves. Deniers could have identifying labels sewn on their shirts. 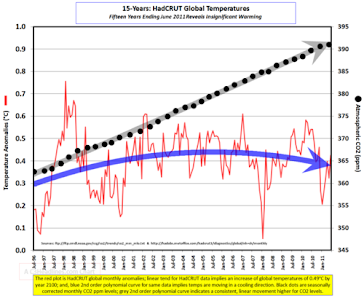 Lord Monckton would be the first in the tumbrils for his heretical statement that there has been no warming for the last 15 years - he should get life. I am not surprised that Lewandovski would have written such an article, but I am surprised that the Conversation would publish a diatribe lauding Hansen with his views on incarcerating non-believers. Well not only did the article stay and my comment not be published but it seems that I am now a non-person and any comments are summarily banned. I am waiting for the knock on the door! UPDATE It seems I have been re-instated and a vigorous debate continues . With unprecedented ice melt in Greenland according to "climate scientists" WW2 planes have been found under a staggering 260 ft or 80 metres of ice. Where did this ice come from and why hasn't it melted? It is this sort of inconvenient physical evidence which causes scepticism in what we are told is being measured by satellites flying overhead. The ice loss figures quoted for Greenland would seem to be at variance with this buildup of ice. Six American fighter planes and two bombers that crash-landed in Greenland in World War II have been found 46 years later buried under 260 feet of ice, searchers said today. A group from Atlanta said it found what became known as the ''lost squad-ron'' last month and plans to tunnel into the ice and lside the eight air-planes to the surface. The other planes will be dismantled and returned to the United States for restoration, he said. Some will be sold to pay for the expedition. ''We have a meeting tomorrow with a contractor from Seattle who is accustomed to doing Arctic work,'' Mr. Taylor said. The saga of the flights began July 15, 1942, as the two B-17 bombers escorted six P-38 fighters from greenland to Reykjavik, Iceland. They ran into bad weather. A German submarine jammed their communications with Reykjavik, and the planes low on fuel and unable to find their destination, returned to Greenland, where they belly-landed on the ice about 10 miles inland. From Friends of science we have a summary of some of the myths propagated about global warming in layman's language as much as possible. Chris de Freitas has much more detail in this paper. FACT: The HadCRUT3 surface temperature index shows warming to 1878, cooling to 1911, warming to 1941, cooling to 1964, warming to 1998 and cooling through 2011. The warming rate from 1964 to 1998 was the same as the previous warming from 1911 to 1941. Satellites, weather balloons and ground stations all show cooling since 2001. The mild warming of 0.6 to 0.8 C over the 20th century is well within the natural variations recorded in the last millennium. The ground station network suffers from an uneven distribution across the globe; the stations are preferentially located in growing urban and industrial areas ("heat islands"), which show substantially higher readings than adjacent rural areas ("land use effects"). Two science teams have shown that correcting the surface temperature record for the effects of urban development would reduce the warming trend over land from 1980 by half. MYTH 3: Human produced carbon dioxide has increased over the last 100 years, adding to the Greenhouse effect, thus warming the earth. FACT: Greenhouse gases form about 3% of the atmosphere by volume. They consist of varying amounts, (about 97%) of water vapour and clouds, with the remainder being gases like CO2, CH4, Ozone and N2O, of which carbon dioxide is the largest amount. Hence, CO2 constitutes about 0.039% of the atmosphere. While the minor gases are more effective as "greenhouse agents" than water vapour and clouds, the latter are overwhelming the effect by their sheer volume and – in the end – are thought to be responsible for 75% of the "Greenhouse effect". (See here) At current concentrations, a 3% change of water vapour in the atmosphere would have the same effect as a 100% change in CO2. FACT: The computer models assume that CO2 is the primary climate driver, and that the Sun has an insignificant effect on climate. You cannot use the output of a model to verify or prove its initial assumption - that is circular reasoning and is illogical. 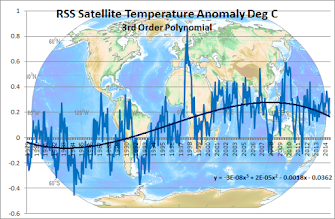 Computer models can be made to roughly match the 20th century temperature rise by adjusting many input parameters and using strong positive feedbacks. They do not "prove" anything. Also, computer models predicting global warming are incapable of properly including the effects of the sun, cosmic rays and the clouds. The sun is a major cause of temperature variation on the earth surface as its received radiation changes all the time, This happens largely in cyclical fashion. The number and the lengths in time of sunspots can be correlated very closely with average temperatures on earth, e.g. the Little Ice Age and the Medieval Warm Period. Varying intensity of solar heat radiation affects the surface temperature of the oceans and the currents. Warmer ocean water expels gases, some of which are CO2. Solar radiation interferes with the cosmic ray flux, thus influencing the amount ionized nuclei which control cloud cover. MYTH 6: The UN proved that man–made CO2 causes global warming. FACT: Glaciers have been receding and growing cyclically for hundreds of years. Recent glacier melting is a consequence of coming out of the very cool period of the Little Ice Age. Ice shelves have been breaking off for centuries. Scientists know of at least 33 periods of glaciers growing and then retreating. It’s normal. Besides, glacier's health is dependent as much on precipitation as on temperature. FACT: The earth is variable. The western Arctic may be getting somewhat warmer, due to cyclic events in the Pacific Ocean, but the Eastern Arctic and Greenland are getting colder. The small Palmer Peninsula of Antarctica is getting warmer, while the main Antarctic continent is actually cooling. Ice thicknesses are increasing both on Greenland and in Antarctica. Green energy enthusiasts find it hard to understand the opposition to the construction of huge,ugly, noisy bird-killing behemoths across the beautiful Australian landscape given the obvious advantages of "free" power which has to be paid for at a multiple of the normal wholesale cost. Origin Energy says a "consumer backlash" is impeding the rapid roll-out of wind-farms to meet the Government's RET target with opposition greater than that caused by CSG installations. WIND power has passed coal-seam gas as a source of angst in the community amid warnings the building of wind farms will have to increase more than threefold to meet the government's renewable energy target. One of the nation's biggest energy companies, EnergyAustralia, has told the Climate Change Authority that the average of 300 megawatts of wind farms installed each year is "already testing the limits of community acceptance", but the new construction rate for large-scale renewable projects would have to increase to about 930MW a year to meet the mandatory 2020 target. The company warns there is a "high" risk with such a rapid roll-out that if projects are not installed quickly enough, a penalty will be triggered and consumers would be forced to pay for it. EnergyAustralia chief executive Richard McIndoe said "the social licence" wasn't there to ramp up construction of wind farms so rapidly. The warning comes as Origin Energy - which is spending billions of dollars on coal-seam gas projects - reveals the community backlash over wind farms is surpassing opposition to coal-seam gas mining. Origin's executive general manager of corporate affairs, Phil Craig, said yesterday: "We get more letters of complaint today from local communities and interest groups about wind farm development than we do about coal-seam gas. "You've got on the one side, people saying, 'do this, do it bigger, build wind'. Then you've got a whole lot of people complaining about wind . . . There are a whole lot of questions around, can you even do this?" Origin has told the Climate Change Authority in a new submission that it will be "very difficult" to approve and construct the new renewable generation required under the scheme by 2020. 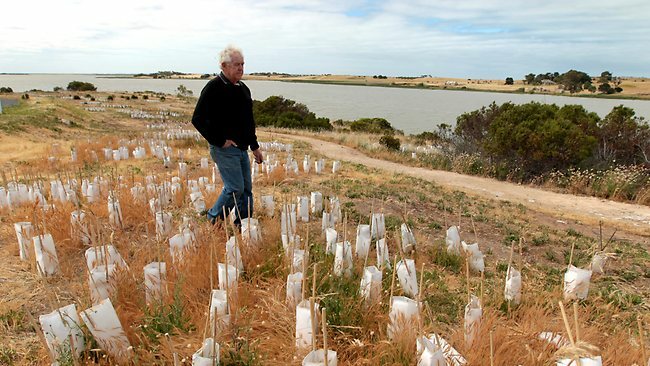 Another Labor green financial waste with millions of dollars spent planting trees along the Murray down the gurgler as the trees are now dead. The long-suffering taxpayer will pay ,as it has for all other Labor green disasters. China's energy policy is a stark reminder that the days of Western pre-eminence are over as the economic Oriental juggernaut concentrates on supplying cheap power to it's burgeoning economy. Contrast that to the efforts of western politicians to shut down their economies by not building new power stations and penalising those that exist.The Manchurian candidate Obama in the US , Gillard and her Keystone cop government in Australia and the socialist Eurobloc all are whiteanting their economies aiding China in it's path to world economic leadership. The US energy policy in contrast seems to be to shut down coal and nuclear stations , build a few bird-mincers here and there and put some solar panels in the desert provided of course they do not disturb the few rodents living there. It is interesting that wind and solar in China only provides a miniscule 1% of total energy and are only used to window dress the huge coal generation expansion to fool gullible Western politicians. Desertec must be the silliest scheme ever hatched by European bureaucrats. The scheme was to supply a large part of Europe's power from solar farms across deserts in Africa, Morocco in particular . Only in the twisted hive mentality of green Eurocrats would North Africa seem a suitable place to site vital power generation facilities. Maybe the solar panels were going to be bomb-hardened and cables put underground. Anyway Siemens and Bosch have seen the writing on the wall and are pulling the plug and I guess others will follow. Tennyson's words have come to life in the fiery colors of a marvelous series of paintings by Australian artist Marie Greene in an exhibition at the Percolator Gallery in Brisbane. Those who can should visit the exhibition or alternatively view the collection on-line at Marie's site. Queensland homes and units without solar power will pay $240 per year to those who have installed solar panels . This means that renters and many of our poorest will be called upon to fund this stupid inequitable scheme. There has been some talk of charging a fixed network charge on a bill to recover some of the costs which may assist as the 44cent per Kwhr rebate will be difficult to change. HOUSEHOLDS will soon be slugged $240 annually to pay for the power produced by rooftop solar systems. 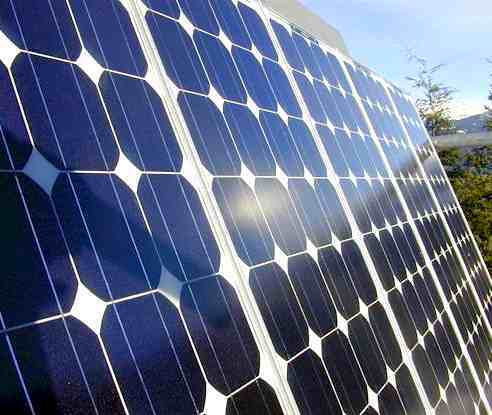 New modelling has revealed that by 2015-16, almost 15 per cent of the total household power price will fund the solar feed-in tariff. The Newman Government has already cut the tariff for home-produced power to 8 per kilowatt hour for all solar systems bought after July 9. However, the new figures exposing the huge burden being carried by all consumers to pay those who produce solar power may prompt the Government to also reduce the 44/kWh tariff paid to those who previously installed photovoltaic systems. Maurice Newman must have had an unenviable job as a conservative chairman of the ABC which was once a proud Australian broadcasting icon and which has since degenerated into a rats-nest of left wing commentators and fellow travelers. Maurice had complained at the time about the bias of the organisation but was unable to comment further in his position. Now he writes of the rise and impending demise of the global warming religion. Alan Jones has been sent back to school by the broadcasting authorities for allegedly saying incorrect things about Climate Change. He should be joined by Professor England who has been rapped over the knuckles by NOAA in the US for incorrectly attributing hurricane Sandy to global warming. It is a classic case of never letting a chance go by to blame global warming for a disaster. AUSTRALIA'S Climate Commission has misrepresented data from the leading US meteorological bureau to highlight a link between climate change and the severity of Superstorm Sandy which this week crippled New York. In a statement on the disaster that hit North America on Monday, the federal government-sponsored Climate Commission said "all the evidence suggests that climate change exacerbated the severity of Hurricane Sandy". Matthew England, chairman of the commission's Science Advisory Panel, said it was important to get the message out that storms today were "operating in a different environment than they were 100 years ago". Professor England said increased humidity, higher sea levels and warmer sea surface temperatures were all contributing to the severity of storms. The commission quoted data from the National Oceanic and Atmospheric Administration that "the temperature of the surface waters from which Sandy drew energy were three to five degrees warmer than average". However, senior NOAA climate scientist Martin Hoerling said the higher sea-surface temperatures quoted by the Climate Commission were not significant in relation to Sandy. Dr Hoerling told US public radio in the aftermath of Sandy that ocean temperatures adjacent to the US eastern seaboard had been running several degrees higher than normal. But he said the unusually warm waters were in areas where the background temperature was relatively cool. "So adding a few degrees Fahrenheit at that cool water temperature doesn't matter too much for the intensity of a hurricane," Dr Hoerling said. President Truman said that "the buck stops here" and was prepared to take responsibility for his actions. The present Coward-in-Chief doesn't agree with that philosophy and Hillary Clinton ,courageously , is taking the fall for him over the Benghazi debacle. When the Supreme Commander is hiding behind a woman the US public must wonder about his ability to lead. Hillary's selfless action shows that the Democratic Party made a big mistake in choosing Obama for the presidency. Obama had two choices over Benghazi - admitting to incompetence or lying. He found another way in blaming someone else for the disaster. The reality probably is that the security briefings on the previous two bombings clashed with his golf days. Australia's chief Antarctic scientists says scientists are not making alarmist claims. I am in complete agreement with him as all the real scientists studying real world climate data using the scientific method such as DR Roy Spencer ,Professor Lindzen of MIT and thousands more are not alarmist. Pseudo-scientists who call scientists who disagree with the global warming religion "deniers", haven't heard of the word falsification which is a fundamental tenet of the Scientific Method. These are the people who deny scientific data such as global warming being non-existent for 16 years and Antarctic sea ice at an all-time record to promote a scare that keeps them all in jobs .These are the people who believe that their garbage-in garbage out computer models are more accurate than real observations. These are the people who believe scientific method is altering data to agree with a favorite theory and not vice versa . AUSTRALIA'S chief Antarctic scientist says claims by climate experts about environmental changes in the southern continent are not alarmist. The Australian Antarctic Division (AAD) told a Senate estimates hearing on Tuesday "rapid changes" taking place across the icy land mass would have significant impact on global climate. Changes in ocean flows and shifts in Antarctic ice cap levels were occurring at rates faster than at any other time in history, chief scientist Nick Gales said. For more information on the disappearing ice this graph from Real Science explains. Of course pseudo-scientists have problems realizing that average summer temperatures of minus 35 degrees Centigrade will not promote melting . Maybe they are not taught that zero Deg C is the melting point of ice. Of course they do all their research on the relatively small Antarctic peninsula which is like extrapolating the climate of the US from Florida. The magnificent duet with Sarah Brightman and Andrea Bocelli. The continued growth of sea ice in Antarctica has been in direct conflict with the "settled science" climate models for years and has culminated in a record ice area this year. Without a shred of embarrassment and ignoring their previous prognostications the climate Illuminati now say global warming causes more Antarctic ice using amazing mental gymnastics to prove their point. These are the same people who came up with a theory to prove that "snowmageddon" in the US was also caused by global warming so they have form in the silly theory area. These people have been, are and will be an incredible stain on the name of science for generations to come and the only consolation is that when the climate house of cards collapses and it will, most of these charlatans will be out of a job. Seth Borenstein gives his "cockeyed" explanation of the cockeyed science theory . "And if all others accepted the lie which the Party imposed-if all records told the same tale-then the lie passed into history and became truth. 'Who controls the past' ran the Party slogan, 'controls the future: who controls the present controls the past.'" Orwell's 1984 tells the story of Ministry of Truth worker Winston Smith who alters the past records of everything that would conflict with the current policies so there is never a historical contradiction. Sound familiar? Of course Winston did not have the internet to contend with and if he had he would have done exactly what NASA is doing and prevent records being stored on the net. This will prevent the embarrassment of present fudged data being compared with the past as the US record clearly shows. I find it troubling that the publicly funded NASA agency GISS would block archiving of such an important global resource. Australia has the dubious honor of installing the most solar panels in the world last year because of government policies making the poor pay the electricity bills of the better-off. Those with solar panels are paid over ten times the wholesale electricity price and this is recouped from renters and pensioners among others. The figures in future will not be as rosy as both Queensland and NSW have cut rebates savagely and the last year's installation numbers reflect the last minute rush to beat the deadlines. The statistic astonished many in the solar industry, given Australia's small population compared with renewable energy market leaders such as European Union countries, China, Japan and the United States. About 392,500 new household solar systems were switched on last year. Australia still generates far less solar electricity than those countries, but the nation's preference for small, individual panels mounted on detached, owner-occupied suburban homes means a greater number of systems were actually installed. No amount of fudging has prevented Hansen's GISS global temperature anomaly from dropping in July to .457 Degrees Centigrade which is what is being portrayed as rampant global warming causing everything from increases in allergies to zoonic diseases whatever they are! Steve Goddard has the latest on Hansen's cheating on Arctic temperatures and you can see from the global map how big an effect the Arctic fiddle with temperatures is having. A significant part of the globe, the Arctic, is shown in red - a spurious 2 to 4 Deg C anomaly where the Danish Meteorological Institute shows July Arctic temperatures at or below normal for the month. 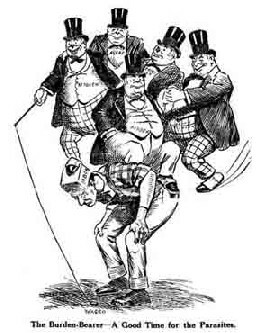 The new board of the 10 billion dollar Clean Energy Finance Corporation has been appointed and has a target of making 4% on green carpet-baggers projects most banks would not touch with a barge pole. The interesting thing is that no renewable energy project could exist without taxpayer handouts and subsidies which are drying up as adults are now in control of most state governments and next year the federal government will fall also. It is hard to see how anyone can make forward projections in this climate. Low income earners pay 1.8 billion for "free " solar power for wealthy. The great solar rip-off in Queensland will continue for 16 years as the poorest people in the community will pay extra so their wealthier neighbours can get free energy. Renters,pensioners and those living in low cost units are the worst hit in this failure of public policy where the government has pandered to the environmental lobby and the green carpet-baggers who are pushing these schemes. Although the new Coalition government has capped the rebate to 8 cents from 44 cents the existing contracts run for 16 years. RENTERS, pensioners and other low-income earners are paying for their wealthier neighbours to enjoy cheaper power under the state's skyrocketing solar subsidy system. The Queensland Consumers Association says costs to subsidise solar are forecast to triple, as the state's bill to fund the scheme continues to grow. More than 100,000 applications were received last month from homeowners wanting to profit from the state's generous 44c per kilowatt hour tariff - twice the retail power rate - which will continue for 16 years. By installing solar systems up to 5kW, the mostly well-heeled applicants stand to earn $200-$300 a quarter from a subsidy that is costing their non-solar neighbours more each year. Energy Minister Mark McArdle has estimated the tariff would cost $1.8 billion by 2028 if the scheme remained unchanged. The July 9 deadline limiting future payments at an 8c cent rate. The Government projects that the annual cost of the subsidy will rise from $50 to $100 for each household from the surge in applications, and another $50 for upgrades to the power grid. Whether the increases will become a reality depends on whether the Government is successful in cutting expenses elsewhere in the budgets of power suppliers, including "community services". Queensland Consumers Association vice-president Ian Jarratt said the threat of a $100 annual hike should be a concern for many people trying to stretch their income. "A dollar is always more for a pensioner," he said.